This is an opportunity to train for a Show Jumping round and XC round under instruction but aimed at being fun and relaxed. 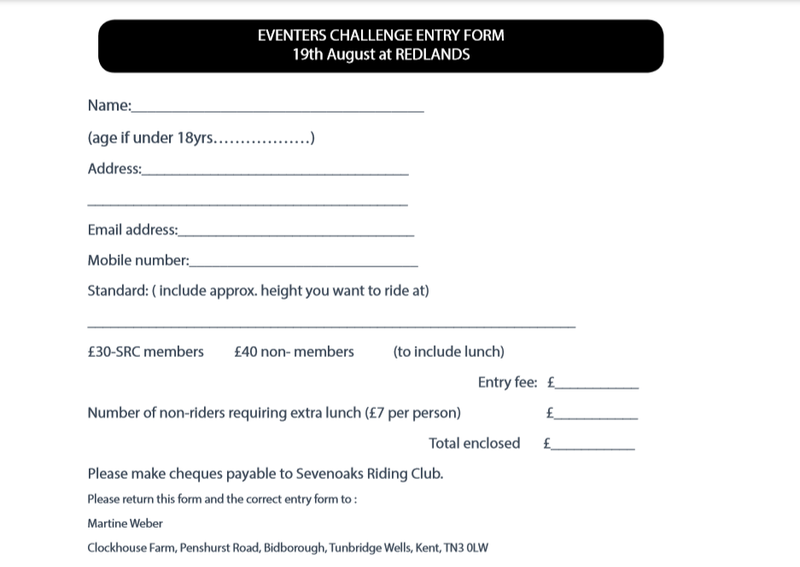 The day is open to Sevenoaks Riding club members and non- members. It is suitable for all standards, please state level on entry form. The day will consist of a group show jumping session. Followed by Lunch (included in the price) and training and practice around the XC course. Finally, riders will be able to complete the Eventers Challenge, both show jumping and XC courses, as a ‘Clear round’ Competition. Please note that this is a ‘Training Day’ not a Competition. We will allocate groups according to experience/levels. We will contact you with group starting times. There will be Qualified First Aiders on site and there will be a ‘Vet on call’ but there will not be Medics or a Vet on site on the day. Please enter and send the correct entry fee to the address on the form.